OK, but what do two cat's lead too? Four or more? We like being just a two-some now that we usually get along! 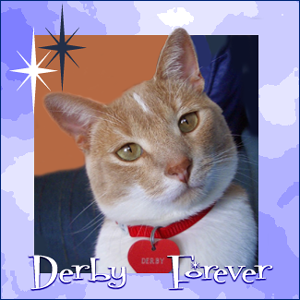 Derby plastered up next to mum keeping her arm all warms. Mum is feeling and sounding better. She was enough better on the weekend to go a play part of both days with racy cars. Said the fresh air probably killed a few bugs! Plus it was awefully cool here this weekend in the low 60's at best. Mum dressed warm for being outside in the cool air and wind. 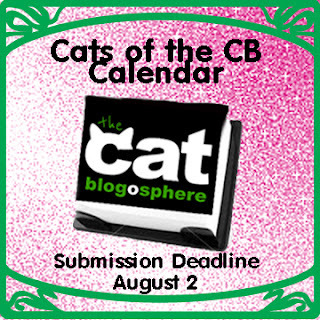 Plus you need to get your pictures in for the 2014 CB calendar. You can go HERE for more details. Mum has gone through two years of pictures so far to find some for us, but wants to go through ALL of her pictures of us for this before Friday. She better get going! It is cool and cloudy. Great napping weather, so guess that is what we will do. Have a wonderful weekend every one. 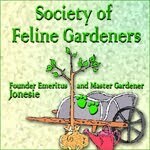 Hello and Welcome to Garden Thursday with your hostess with the mostest Virginger. Well we had a big change this past week, they stole a tree! Well, mum says they didn't steal it, as it was supposed to go away since it was dying. She had to pay them to take it away. Monday a week ago a bunch of guys in orinch trucks showed up and took the tree down just far enough to get under the electrical wires. They piled every thing up and then left! Then on Friday of last week, guys in white trucks showed up. They cut down the rest of the tree, chipped it all up and then ground the stump away. So nothing left but a bit of tree all mulched up. Mum said the tree was dying and was an ash tree. In some nearby spots of Whiskerconsin there is a nasty but called the Emerald Ash Borer. It attacks ash trees and kills them. Mum didn't want this tree to be a weak spot that might be a point of infection to start in our area. So away went the tree. Our other ash tree is nice and healthy. Mum still sounds weird, specially tonight after mowing the lawn. Her breathing sounds a bit like asthma. She says once she gets a good cold drink to wash down the outside crud, she will sound better. That is all from our garden for this week. It is absolutely beauty-us here. Mum has the windows wide open, a gentle breeze and we are all loving it, including mum. Although mum sounds a bit off. Her voice is icky, sounds like she has been eating rocks! She is tired and while she came home late from work Monday, she was right on time today. We know she isn't with it. She left the talking box on when she left to day hunt today. We will try to get her into her sleepy spot on time if not early today. Us, in the open window! I don't think we would, ahem, do our bizzness on mum's puter. If we did, we wouldn't be able to blog and let you know what is going on here. So, what is going on here? Not a whole lot. We got cooler air, rain showers late Sunday afternoon, so lots of open windows for us to enjoy. Mum did her chores and Derby decided he needed to help with the bed making. Well at least she had the good sense to just leave me be and finish making the bed later. It was nice to sleep between freshly laundered sheets! Mum went out to eat Caturday with Miss Lynn. She brought home a box but says it is not for kitties! Says it has spicy Eye-talion sausage in it. But we did get some gooshy foods on Sunday for lunch, so I guess that evens it out. It is finally nice again, so we have open windows and fresh air to enjoy. Mum likes it too. Or just napping the morning away. Enjoy your day! We are and mum is bizzy doing her chores. All is well. Hello and welcome to Garden Thursday with Virginger. At least this week we can upload pictures. So here is what I wanted to show you last week. This is two weeks ago, the flowers stalks had sprouted up on our yucca plants. This doesn't bloom every year. Maybe it has to do with rain as we had lots of rain this year. The pictures below are from last week. You can see the flowers opening up and other shots of the whole plant. The neighbors have them too and they are blooming and still have blooms on them two weeks later, they last a long time. Mum is seeing others as she goes day hunting or driving around town. That is all for this week. Thanks for stopping by. HiYa, Ducky here again. Some of you commented on the Galileo thermometer in our last post. This is a touchy subject with mum. 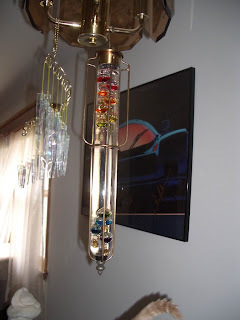 A number of years ago Derby messed with mum's Galileo thermometer not with good results. Mum was ready to have him lose one of his lives! You can go back here to see the results of broken glass in the middle of the night! The little one you see in this picture was Grampie's and mum took it over. It is plastic so not likely to break. Plus mum has her really good one and that is out of our reach now, but when she first got it, yep, you know who was at it. See his tail? Then he was ready to tap at it. Mum has it hanging up high now, we can't get at it. So hopefully no more breaking of things! If it's not tied down, it's a cat toy. HiYa, Ducky here. It is Monday again, time for us ManCats to show our stuff. 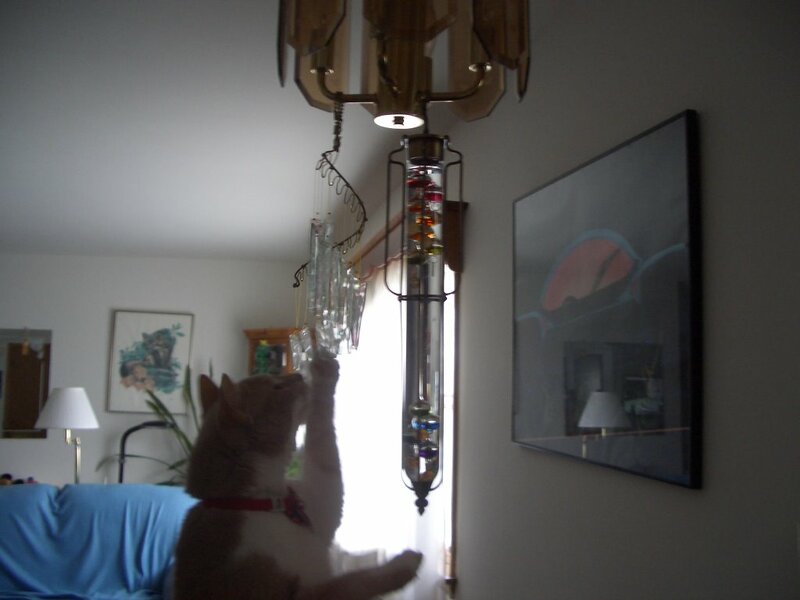 On Caturday we showed you this top picture of Derby messing about with mum's glass of pens. Laila and Minchie wanted to know how he got there without knocking something down. Well he did knock something down, his picture! Better to knock over his picture than mine! But we have a back way to get on this shelf. And the picture was knocked off from the back, not front! We get on the table next to it and walk in from the back! The case stands away from the wall by a few inches, more than enough for us to walk through. Plus mum's music playing machine sticks out the back, so we even have a place to walk! Easy Peasy. Here you can see the table, the music player and the cabinet. I have been back there too. Me getting back there to check out the silk flowers. Yep, mum caught me, but I don't care. She knows we explore all sorts of places and as long as nothing is damaged, she is OK with that. The hots are back, so the cool blowy thing is working and the fans are moving the air around. Mum makes sure we don't get too hot even if we are inside the house. Excuse my backside but, the windows are open, it is a beauty-us day. Enjoying the fresh airs. The windows are wide open and soft breezes are coming in. Derby is getting places he shouldn't, messing about with mum's mug full of pens. Oh, the doorbell just rang. gotta go hide. Have a great Caturday. 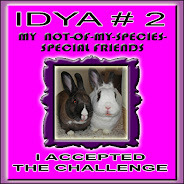 Well mum can't get an pictures to load other than the top one which has been used before. So since we can't show you anything new. Here are some oldies but goodies. The thistle that mum didn't see until it was all big and blooming last year. Lillies, resurrection lillies mum calls them. Star-gazer lillies, this didn't come back this year. Probably because of the drought last year. The old butterfly bush with a monarch butterfly. Mum wishes these would survive more than a year as she likes them so much to get butterflies. So that is it, hopefully next week we can show you what we wanted to show you this week. We have a neato plant blooming right now. Hmmm, we don't have a woofie around here to blame. Not sure we want to get one just to have someone else to blame stuff on. 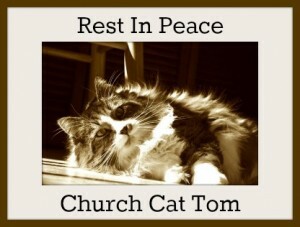 We were bummed to find out that Church Cat Tom ranned off to The Bridge, his mum traveled over 10 hours to be by his side at the end. 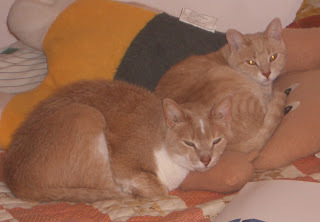 Lots of purrs to them and to Olives family too. We had a quiet rest of the weekend. Mum went off on Sunday to be Wicked! She came home humming songs and all about being Popular and Defying Gravity. Not gonna happen mum, trust us, we are the two who are popular and can defy gravity. 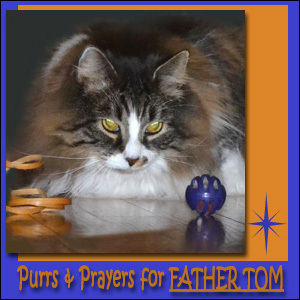 First we want to send out healing purrs to Olive and ChurchCatTom. Both are not feeling well and getting extra care. 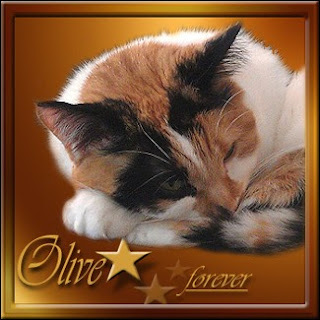 Update: We found Olive ran off to join her brofurs, Opus and Roscoe, at The Bridge. As for us, we are fine. Mum gave us breakfast in bed as she had treats in her jammie's pocket from last night. MOL, she is not the princess on the pea, she didn't remember them until we started putting our noses into her pocket. Mum is bizzy with the usual weekend stuff along with going to get her boobities smooshed like she should. Plus get her hair all curled this afternoon. Since she will be gone, we can have nice long naps.